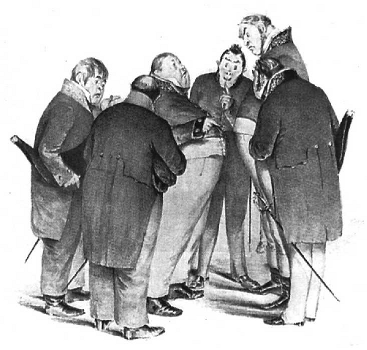 The Government Inspector (or Inspector General) by Nikolai Gogol is the funniest Russian comedy. Gogol rejects traditional devices such as the love interest, the conventional happy ending, the character that is the author’s mouthpiece, and the commedia dell’arte type of role development. Instead, he creates complex, living characters that combine both typical and individual traits and refuses to divide them into good and bad. Most of them are rogues but all display a mixture of qualities. This comedy, both in its characterization and in its language, is much nearer to real life than any previous Russian play. We will discover how Gogol reduces the disharmony, which seems to him the very essence of reality, to comic grotesque through laughter. In this, Gogol anticipated the Western European theater of the absurd of Ionesco and Beckett. Class Format: The workshop will meet on two consecutive Tuesdays, June 17 and 24, 2014, from 11:00 am to 12:30 pm CDT. Each session will consist of a 20 to 30 minute lecture by the teacher, followed by a group discussion. Estimated Cost: $50.00. Please read the terms of payment here.